In the year 56 BC. 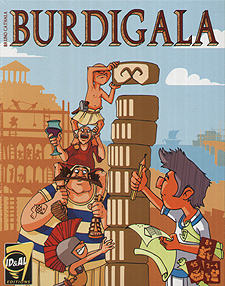 Where the rivers Deveze and Garonne meet, the town of Burdigala is growing. Thanks to its upstream port it has become a trading post controlling among other things the passage of Gaulish tin, Iberian copper and Greek cermaics. Julius Caesar has sent Publius Crassus, the top Roman town planner to erect buildings worthy of the town's prosperity. Theatres, aqueducts, temples etc., are being built to the glory of Rome. You are an ambitious young local dignitary. In order to become the best among your peers, you must increase your prestige by assisting Publius Crassus in the construction of various buildings, but also in controlling the commerce in the river port.